A basic, no-frills recipe for roasting a whole turkey. Be sure turkey is completely thawed. Remove turkey from original wrapper and remove neck and giblets from cavities. Rinse turkey thoroughly with cold water; drain and pat dry with paper towels. Tuck wing tips under back or tie to body. Refasten drumsticks with metal or plastic clip or band of skin. Place turkey breast-side up on wire rack in shallow roasting pan. Insert meat thermometer into the thickest part of the inner thigh; do not let thermometer touch bone. If desired, brush skin with vegetable oil. Season with salt and pepper inside and out. Roast uncovered until skin reaches desired brown color; cover loosely with a tent of aluminum foil for remaining time. Roast until thermometer reaches 180°F (approximately 80°C), about 2 3/4 to 3 hours. Remove from oven; let stand 20 minutes before carving. If stuffing turkey, the stuffing should be prepared and loosely packed into the turkey just before placing turkey in oven. Increase roasting time to 3 to 3 1/2 hours. The stuffing should register 165°F on meat thermometer. 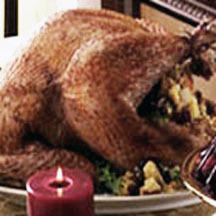 To ensure food safety, remove stuffing immediately after cooling; do not store in bird. The following information is provided by the USDA Food Safety and Inspection Service web site, regarding the timetable for cooking a fresh or thawed turkey in preheated 325°F (160°C) oven. These times are approximate and should always be used in conjunction with a properly placed thermometer. Recipe and photograph provided courtesy of Ocean Spray Cranberries, Inc.